This review contains some spoilers (although nothing more than what the trailers have already spoiled). This is an extremely competent adaptation. It is gorgeous, well written, well acted, and appropriately heartwrenching in places. It is absolutely an improvement over the first installment – only, because it's a middle chapter, things didn't wrap up in an entirely satisfactory way. This was also a big issue with the book. For me though, I had all three books in my greedy little hands when I first read the series, so I didn't have to wait for the resolution. Unfortunately, this movie series has another two years to go at least, since Mockingjay is going to be split up into two films. I think that's my only major gripe with this one – except maybe for the fact that I didn't really get a sense of threat from the other tributes in the arena scenes. Those characters showed up in the second act and got set up well, and then we didn't really get to see much of them in the third act. Although from what I remember of the book, there was a similar issue with the other tributes being killed off screen. Jennifer Lawrence shines as usual as the same heroine we got in the first movie, but who is now suffering from PTSD, too. Katniss's struggles in this installment felt genuine, and Lawrence managed to sell her strengths and vulnerabilities in a way that didn't undercut the character. That's impressive, considering almost everything that happens to Katniss is horrific. The events that dealt with the aftermath of the first movie were all very emotional and brutal, blended in with some rather bleak scenes of oppression. This builds up, of course, to the 75th annual Hunger Games, which is made special because of some arbitrarily evil reasons involving the fact that it's the third quarter-century game. Instead of choosing kids, the reaping consists of tributes culled from the existing pool of victors. In other words, everyone who survived and thought they were safe for the rest of their lives are suddenly yanked from that safety and plopped down in another fight for their lives. The pain felt about that reversal was palpable, mostly on Lawrence's part. Katniss is almost numb, going through the motions in a fight to stay alive through one more game. Except this time things are different – she has some allies, and the environment is far more deadly. From lighting and floods to killer apes and other nasty surprises, the way the games unfold is more about what happens in the arena than who is fighting whom. Thankfully, Lawrence didn't have to carry the movie on her own. Nearly all the supporting characters and actors were excellent, too. The stand outs for me were Jena Malone as Johanna Mason and Sam Claflin as Finnick Odair. They both managed to successfully tread the line between good and bad so that it wasn't clear which side they were on. Donald Sutherland gave another creepy performance as President Snow, and Woody Harrelson, Elizabeth Banks, Stanley Tucci, and Lenny Kravitz all added depth to the background players. And new addition Philip Seymour Hoffman added quite a bit of restrained menace as game maker Plutarch Heavensbee. I wish I could say the same about the male leads, Peeta and Gale. Neither were bad, but neither really worked for me as anything other than tacked-on angst for our leading lady to deal with. Honestly, given everything she suffers through, I'm not sure putting her in a love triangle too is really necessary. Maintaining one relationship in this kind of situation would be next to impossible, trying to figure out two conflicting and complex emotional situations while dealing with the trauma of fighting for your life and being a symbol for a potential revolution is simply too much. 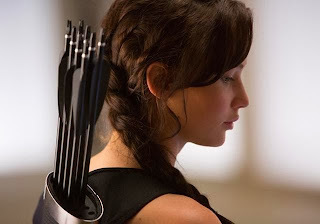 The fact that Katniss functions at all is impressive. The visuals are stunning and the increased budget really shows though with a much clearer depiction of the Rome-like Capital. The sense of dread and the brutality and unfairness of the world is also captured very well. The situation, and why thing are unraveling make total sense even without a ton of exposition. Perhaps the first hour of the film could've been shortened so that we got into the games faster, but at the same time that set up gives weight to everything that happens later. For a nearly two and a half hour movie, it sped by pretty quickly. It wasn't perfect. There are some flaws in pacing and structure, but that's more of a criticism of the book than the movie. I think this is an excellent adaptation, and a pretty damn good movie, too. Great review, JD! I'm excited to see this, but not excited enough to go to the theater. But I'm glad to hear that this adaptation had more teeth than the first film. I loved the film and spent half of it silently bawling. But there was a moment at the end where I got the giggles briefly because somehow it seemed funnier than the same scene in the book - the bit where Katniss is yelling at Haymitch and Plutarch for abandoning Peeta and they drug her and she wakes up next to Gale. As if they're saying, "We're sorry we let your boyfriend be captured and tortured by the Capitol; please accept this replacement boyfriend with our best wishes."